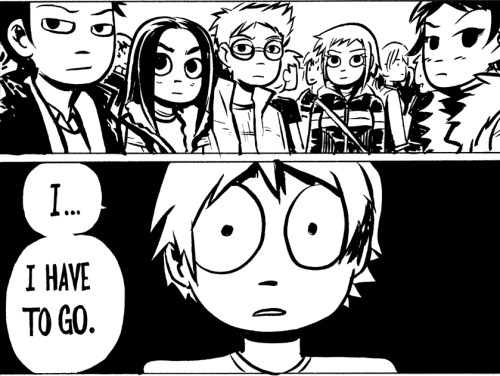 Why Scott Pilgrim is the best Indie comic out there. I glance over online comics or manga every once in awhile. Theres plenty out there covering pretty much everything topically but none closer to my heart than Bryan Lee O’Malley’s “Scott Pilgrim” series. I first ran into one online a few years back. I noted that I should pick up the series (I don’t like reading stuff entirely online) and oneday last year I was in a bookstore and there they were starring me in the face, I decided to get Volumes 1 and 2 as a refresher. Needless to say I was running back to this specialised bookstore within the week for the rest of the series. Scott Pilgrim’s life is totally sweet. He’s 23 years old, he’s in a rock band, he’s “between jobs,” and he’s dating a cute high school girl. Nothing could possibly go wrong, unless a seriously mind-blowing, dangerously fashionable, rollerblading delivery girl named Ramona Flowers starts cruising through his dreams and sailing by him at parties. Will Scott’s awesome life get turned upside-down? Will he have to face Ramona’s seven evil ex-boyfriends in battle? The short answer is yes. The long answer is Scott Pilgrim, Volume 1: Scott Pilgrim’s Precious Little Life! It’s kind of scary how one can relate to the scenarios and characters Bryan Lee O’Malley has dreamt up. It’s not easy being a mid 20’s slacker who plays in a band whist dealing with conflict of the female variety via 8bit retro coloured video game glasses. My private life aside though, I love how Bryan contrasts “mundane” reality in this book, you think everything is going swimmingly and it’s all rather realistic… a miniature sitcom based around your musical life. Until Scott Pilgrim is found fighting off his new girl’s evil ex boyfriend(s) in true video game / anime style. It’s perfect. Imagine your favourite ‘cool’ (Skins?, Buffy?) sitcom revolving around bands / good music and add… Naruto-esque battle scenes. You’ve got Scott Pilgrim. Basically the series progresses through the troubled waters of life revolving around relationships, music(being in a band), friends and the mirky history of its characters. Nerd alert time: It manages to drop subtle one liners and plot points referencing an array of oldschool retro late 80’s mid 90’s videogames. The Secret of Monkey Island (PC), Super Mario Bros /series (NES), Clash At Demonhead (NES), Crash n the Boys (NES), Zelda (NES)? and/or some other earlier EXP based game, River City Ransom (NES), Sonic The Hedgehog /series (SEGA), Bomberman (NES), Street Fighter (Arcade). The series has a distinct ‘punk’ or ‘indie’ feel to it. There’s a heap of music referenced and a deep music knowledge (as lengthy as the retrogaming list no doubt) but I cbf hunting back over it. Think mid 90’s Indie bands though as well as some classics. Anyway this all adds up to give Scott Pilgrim a sort of shiny nostalgia to it. It feels completely genuine. I suppose the subject matter isn’t for everyone. But if your reading this blog then chances are you’ll be into it! You can read previews of all of the Volumes online at the official website. There are currently 5 volumes in stores with a 6th and *gasp* final still being written, to be released soon. It’s kind of hard to explain a Series really, perhaps I should have just reviewed the Volumes one at a time! Maybe I will down the line until then though you’ll just have to grab one off the shelf! ALSO the big news last year was A real-life movie adaption is being made. Which will either ruin the series for everyone and there will be a bunch of rabid SP fans ready to hunt down and combo dragon punch the director to his demise OR it’s going to be great and hence the best movie of 2010. Fingers crossed for the latter. All the latest on the movie. If thats not all, a videogame has also been announced! It will apparently be oldschool sidescroll beatem-up. HECK YES!